Coming off the heels of a loss to Jacksonville State a week ago APSU looked to rebound against in-state rival Tennessee Tech but fell 7-0 in the match. With the loss, APSU drops to 1-2 in conference play with just two more matches to go before the conference tournament. 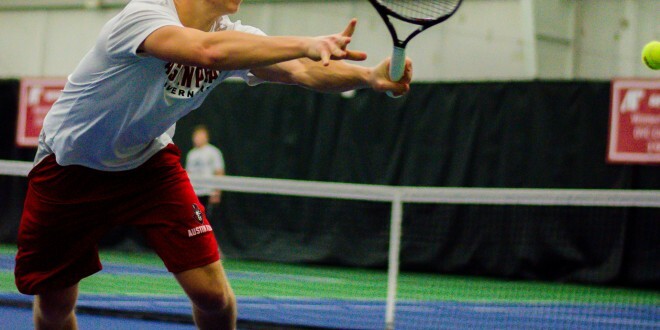 The day started out poorly for APSU as the No.3 doubles resulted in a 6-0 loss for the Govs. From there, the Golden Eagles took a 6-3 win in the No. 1 doubles to secure the first point of the match. The Golden Eagles also began strongly in the singles to the dismay of the Govs. APSU lost the No. 3 singles without losing once to advance a 2-0 lead in the match. Almantas Ozelis lost his singles match to the top-ranked player in the OVC Rafael Tosetto. The Golden Eagles clinched the match early with a win at the No. 4 singles. APSU’s Christian Edison won his second set but fell in the third set tiebreaker. The Golden Eagles defeated the Govs in the No. 5 and No. 6 singles in straight sets to conclude the day. The Govs travel to Eastern Illinois for their last road match of the season. The match is set for April 12 at 10 a.m.